every thing was good, just forgot my order. The service and the food was amazing. The pork ribs, fried goat cheese with dressing, the duck, calamares, we found everything so amazing and tasty. I’m definitely coming back. My family were zo amazed with such flavors and the service !!! It's clear from many decorations and utensils in the store that this was a family-run business. The service was superb and the portion that we had was way more than we thought (which is always a good thing)! The bread with tomato, what my friend said was local here, tasted the same as I expected: not for me. However, the bravas and the pork ribs were oh-so-good. My star dish, as they called, was Selena burger; a beef burger with avocado, goat cheese, and blueberry sauce. Sounds weird? The taste definitely wasn't. It was awesome. We finished our meal with Crema Catalunya and it was very nice. We called for our bill and accompanying it was a playing wooden music box with the restaurant's slogan carved on the cover. It said, "Be simple, be happy." Indeed. p.s. The restaurant has vegan and gluten-free menus, too. Un sitio agradable para ir a comer o cenar. Really nice food and excellent service, would definitely recommend. We found this place off Tripadvisor reviews and we were glad we did! It is a gorgeous little restaurant with staff going above and beyond to make you feel welcome and at ease with your meal. We booked an hour before we wanted to eat and the place was full so booking is recommended after 9pm. We ordered some tapas then some more as we enjoyed it that much! We then left room for dessert which we are glad we did. From start to finish our dining experience was spot on! Highly recommend!! Very good food but small portions. Exzellent service and nice atmosphere. An absolutely amazing place , excellent food, brilliant staff . I can't recommend this place highly enough, in fact why are you still reading this review and not booking a table right now !! Environment, staff and food were all amazing! Logical prices and super friendly people working! My favorite place in Barcelona, I strongly recommend it! the food was great and the atmosphere was very homey and comfortable! If you go, save some room for their desserts!!! Las criticas leídas nos generaron grandes expectativas que no se cumplieron. Calamares y hamburguesas sin sabor, hummus decepcionante, solo los postres se salvaron. 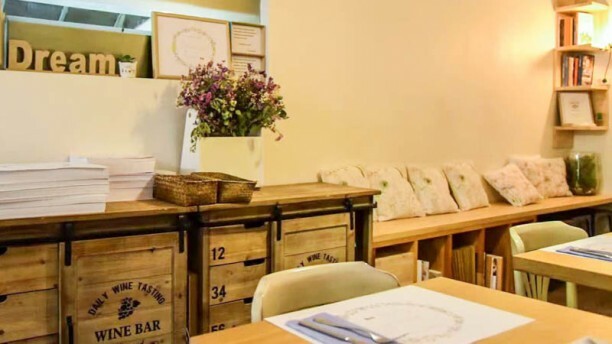 The best tapas and service in Barcelona! Nice place, out of the ordinary -in a good way. Great food,nice service, will go back! Excellent service, you can tell everyone is very dedicated. The decor is beautiful, sangria was amazing, price was very fair. We loved everything about it, can't fault it at all!